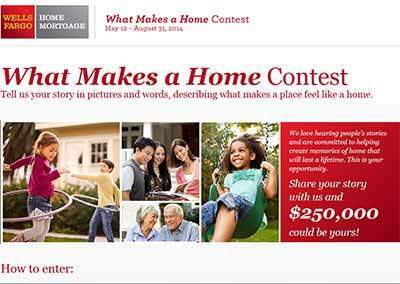 www.wellsfargo.com/ homecontest – What Makes a Home Contest 2014. Wellsfargo Online Banking is sponsoring this amazing contest where an amount of $250,000 will be awarded in the form of a check to the winner or the contest winner can choose to apply their winning cash prize to their purchase loan transaction. We all know that a mortgage or a purchase loan is an important financial responsibility and winning this amount of money could surely become a relief by paying off this debt. How to enter www.wellsfargo.com Contest 2014? Simply by telling them (WellsFargo) your story in pictures and words describing what makes a place feel like a home. By making a well-defined and well-written essay about it you increase your chance of winning the Grand Prize. Assuring that your submission and essay must be believable and sincere. The Entry is original and has been legally created by entrant. To enter the Contest, visit www.wellsfargo.com/homecontest (the “Web site”) between 8:00:01 a.m. ET on May 12, 2014 and 11:59:59 p.m. ET on August 31, 2014 (the “Entry Period”) and follow the online instructions to complete the registration. Read rules or instructions carefully. Things such as spellings, sentence construction, grammar, tenses, etc are often ignored. So be alert and take your time to reread your text. Always remember this when you write: Every story should have a beginning, middle (which sometimes or often serves as the heart of the story) and should have an ending. The construction of your story is important. PRIZES: GRAND PRIZES (3): Three (3) Grand Prize winners (one  from each Judging Period) will each receive $250,000 awarded in the form of a check. Approximate Retail Value (“ARV”) of each Grand Prize: $250,000. TOTAL ARV OF ALL PRIZES: $750,000. Love each other it is the Glue that keeps the family together. What eve happens Heart ache or good times or sorrows. Love is the one thing that every family needs. Respect for each other. Be there for each other no matter what. If a family has love for each other you are there to help when needed, The Family will make it thought with love as the heart of the home. Time’s that may come when you need someone and family will always be there when love is strong. .Honor one another as well as Love one another. If God is in the hearts of the family the family will stick together because God is the strength the carries us through all things.. God is love and God is what we need when hard times come we not only have a family that will stick by each other. But God is the one carrying us when we need him the most. Only one foot print while he carries us along the path of life. During that time we will have many things that happen to us that we will need GOD to carry us along life path. God is the Glue he sends his Spirti and the Spirit will make our lives Sing if we will only let him be the person in our lives that Teaches us how to truly love one another and especially in this day and time. Love will make a family what it should be . I would love to win something especially a home of my own. God please help me to win $1,000,000,00 October 9th for my life changing for my family for my daughter , my friends for the other people really need. God you know my heart and you know my life , I can fool it people but I could not fool it you. please God anything you will give it to me , I will be appreciate because you know what I deserve you know what I need that’s my prayer and I hope my dream come true it will be a miracle for the rest of my life. Never had my own home! Would like to win be in it to win .